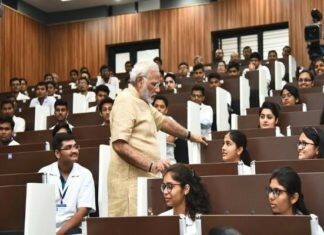 Prime Minister Narendra Modi will interact with students, teachers and parents about examinations and related stress on January 29. The government has invited students from across the country to register on MyGov.in and participate in the ‘Pariksha Pe Charcha’ contest and get an opportunity to interact with prime minister at Delhi’s Talkatora Stadium. The competition is only for students studying from classes 9 to 12, graduate and undergraduate, their teachers and parents. For school and college students, there is a caption writing contest. Another contest is for college students, where they will have to share their exam success strategies via video or text. The selected responses will also be featured during interaction with PM Narendra Modi.